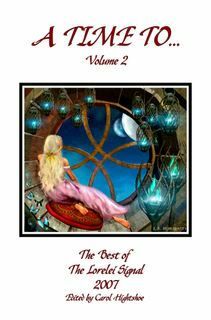 Mirror Dance: "A Time To...Volume 2: The Best of the Lorelei Signal 2007"
"A Time To...Volume 2: The Best of the Lorelei Signal 2007"
Now in its second year, The Lorelei Signal is a quarterly webzine dedicated to featuring strong female characters in works of Fantasy. Editor Carol Hightshoe, whose 2006 anthology A Time To…Volume 1has been named as a finalist for the 2008 EPPIE award for fantasy and nominated for the celebrated Tiptree award, now brings together the best short stories and poems of The Lorelei Signal’s 2007 edition in A Time To…Volume 2. Opening the anthology is Samantha Henderson’s “Cinderella’s Funeral,” an elegantly executed poem with a surprise ending. After the early death of her Prince, Cinderella goes from a fur-slippered princess to a warrior queen. Henderson presents potent imagery and wastes no words in doing so; this poem makes a powerful statement with its unique take on the fairy tale and is the perfect opening for a strong and varied collection. Next from the January issue is “Ellette’s New World,” a coming-of-age story by Gene Stewart. After her mistress is killed in battle, Ellette must find her own way in a world that seems determined to hold her back. Dedicated to the memory of Marion Zimmer Bradley, this story would not feel out of place in one of MZB’s popular Sword and Sorceress collections. Ellette is beautifully characterized, an intelligent, resourceful woman the reader can sympathize with. If this story has any fault, it is in the occasional awkwardness of the prose—“a small nod bobbed her head once”—but overall, Stewart’s work is original and attention-grabbing. Justin Staunchfield gives us “Portrait of the Artist in Manganese and Copper Oxide,” a wonderful combination of what-if’s and observations. On an expedition to Terran Analog 17, Teri Rozan has an encounter that will change her views on art and life forever. Though more science fiction than fantasy, this story is well-written with engaging characters and many surprises. With his excellent dialog and realistic details, Staunchfield brings Teri’s world—and her journey of personal discovery—to life. This story is truly magnificent, and one I will enjoy rereading. The best of the January issue closes with “The Witch’s Revenge,” by Barbara Davies. This story provides a superbly witty and readable sequel to Hans Christian Andersen’s “The Tinder Box,” following the unfortunate witch Trudel (who lost her head in Andersen’s original tale) as she goes on a journey to reclaim her grandmother’s tinder box. Trudel is an original character readers will enjoy getting to know, and Davies provides her with an ending that I will only say is far more satisfactory than the original. “Harleys in Driftwood,” by C.A. Casey, opens the best of the April issue. When the quiet artist Tara decides to display her unique driftwood sculptures to the public, her work has a startling affect on its viewers. Though not as strongly speculative as the other works in the anthology, Casey’s story is original and entertaining. The artist Tara will remind readers of many an eccentric friend, and I can guarantee you will never look at driftwood the same way again. Next is the beautiful “Her Sheltering Wings,” by Elizabeth Barrette, a common name on the Lorelei Signal’s table of contents. Barrette’s work balances powerful imagery with a poignant exchange between lovers; it is at once inspirational and heartbreaking, and one of my personal favorites from the anthology. Linda Epstein’s “Kaserie’s Choice” begins with the age-old formula of a female dressing as a male to escape confinement (in this case, slavery), but by the end of the story, no one would mistake it for a conventional fantasy. Epstein’s careful world-building comes through in a multitude of details, and Kaserie’s moral dilemma at the end is finely presented. The story might benefit from a few paragraphs being cut from the beginning, but from the moment the Seeker is introduced, the revelations and surprises are perfectly paced. I hope to see more of Kaserie and her world in future issues of the Lorelei Signal. “Retirement” from Lindsey Duncan takes a unique approach to fantasy warriors in the form of Taris, a sixty-two year old knight looking to spend her retirement raising horses in her childhood village. But will she spend it alone? Duncan’s smooth, original descriptions give this flash fiction a strong sense of place, and the unexpected ending is well presented. Closing off the April issue is B. A. Barnet’s chilling “Second Moon.” Governor Falev has murdered his brother and taken his beautiful wife, Aritei, for his own; but the spell that keeps Aritei’s will subdued has also affected her mind. This story combines human, believable characters with strong pacing and powerful irony. Aritei’s character is the perfect blend of beauty, innocence and mystery, and readers will cheer her triumph with the intoxicating feeling that justice has been served. Marva Dasef opens the best of the July issue with “A Visit to Potter’s Field,” the humorous story of Griselda, a not-so-recently deceased gypsy doomed to answer a question for whoever digs her out of her grave. Dasef’s wit and Griselda’s long-suffering tone provide a sense of light-heartedness between two of the darker pieces in the anthology; this is a story you can’t help but want to share with a friend. Megan Arkenberg’s “Leanansidhe” (pronounced “lan-awn-shee”) poses the question, how far would you go for inspiration? This lengthy, tightly structured poem follows the speaker on a quest for Leanansidhe, the fairy muse of the Isle of Man, who demands a high price for her service. Arkenberg provides an interesting and original approach to the myth, though the poem’s 126 lines may be daunting to some readers. Next comes “Mentor for Hire” from Gloria Oliver. When the alchemist Rees puts out an advertisement for her mentoring services, a babysitting job for the hyperactive Justinian Alfredo Sebastian Rockspear IV is not at all what she had in mind. Oliver combines strong characterization and witty description in a story that is both funny and heartwarming. “Broken Vows” by J.C. Lee tells the story of Hippolyta, Queen of the Amazons, and the choices she must make between her promises to her husband, Theseus, and her kingdom, Lemnos. While drawing many of her characters and settings from Greek mythology, Lee provides them with personalities and motivations that modern readers will recognize from personal experiences. Hippolyta’s dilemma is well-present, and the story kept me guessing until the very end. J. J. Fellows’s “Tempting the Fates” goes where few fantasy stories have gone before; into the weaving room of the Fates themselves, with Lilith and a bottle of wine. While the battle over the “traditional” role of women is frequently waged, the results in this tale were a very pleasant surprise. Fellows moves smoothly between the philosophical musings and Lilith’s ironic solution. Next, Marva Dasef brings us “The Delegate,” a thought-provoking tale of a different kind of prejudice. While serving as a delegate at the World Congress, Nioba Kune encounters an android who will change her views on his kind and his world. While the terminology makes this story occasionally hard to follow, the wonderful conclusion is well worth the effort. The final short story in the collection comes from Kapri Sanders. “The Unholy” follows a fast-paced debate between Olin and Endellion, a literary pair the reader is sure to quickly recognize. Sanders’s approach is both witty and original; the author made a wise choice in keeping the story brief and to-the-point. The anthology closes with Jessica Wick’s lyric “Virgin and the Unicorn,” a new approach to the timeless myth. Wick’s imagery and powerful use of repetition make this a poem well worth rereading. Overall, I was most impressed by the variety and consistent quality of the works in this anthology. A Time To…Volume 2 is scheduled for release on March 15 and will be available to purchase through WolfSinger Publications at lulu.com. The Editor’s other e-zine, Sorcerous Signals, will be releasing a “best of” anthology called Arcane Whispers in May. The Lorelei Signal’s current issue. Megan Arkenberg is a writer and poet from Milwaukee, Wisconsin. Her work has appeared in many webzines and anthologies, including The Lorelei Signal, Rose & Thorn, A Fly in Amber, and numerous haiku and tanka publications. Her story “Panthanatos” was included in Hadley Rille Books’ Ruins Metropolis anthology earlier this year. When not writing, she divides her time between music, painting and editing Mirror Dance.